* Sensor type – Thermistor. * Vacuum Range: 0-18000 microns. Features - * Sensor type – Thermistor. * Vacuum Range: 0-18000 microns. * Display – Resolution: 0.2 micron * Units: Microns, mbar, Pa, Torr, mTorr, psi, inHG * Operating Temp. 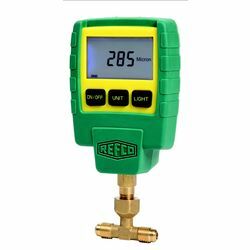 Range: 0°C-40°C * A high quality product from Refco, Switzerland.